Longtime agebuzz readers already know that walking briskly may have positive health benefits. And now, with the results from a new research study, it seems your excuse for not taking a brisk walk just got flimsier. It turns out, just one hour of moderate-to-vigorous exercise per week (10 minutes/day) can help you remain disability-free, especially if you suffer from knee osteoarthritis. Given that some 14 million older adults deal with the pain and limitations from this disabling arthritis, an easy exercise routine of a daily brief and brisk walk should be of great benefit to millions of people. So tie up those laces and read about this new recommendation here. But how do you best accomplish brisk walking? One way to do so is by using the Nordic walking method of holding poles in your arms while you walk. Over at Next Avenue, you can find a good description of the strategy and equipment behind Nordic Walking and how your whole body can benefit from a Nordic walking routine. 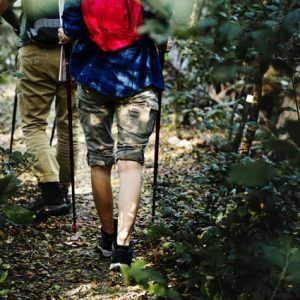 There’s even an American Nordic Walking Association that can give you guidance about equipment, walking groups and the best techniques to use. Or, if you’d like a visual demonstration, stand up and take a look at this YouTube demonstration video.